Guest post by ShipWorks, eCommerce shipping software that connects multiple online stores with all major shipping carriers so that you can save time, money and ship with joy. You’ve heard it said before – think globally, act locally. But how do you actually put those words into practice? We’re about to tell you! Being able to ship internationally gives savvy business owners like you the ability to easily position your business for tremendous growth. In fact, an entrepreneur that looks beyond the borders of the United States can tap into a global marketplace of 7 billion people, compared to only 300 million in the U.S. This is especially important today since independent reports have repeatedly shown that the largest area of eCommerce growth is overseas. This is all great news for small businesses, but for some entrepreneurs, the task of selling and shipping a product internationally is intimidating. But that’s about to change. We’re going to reveal tips to help your business succeed at selling and shipping around the globe. 1. Localize the eCommerce Shopping Experience. As a business owner selling to customers in the U.S., you know that a simple, easy-to-use website with creative product descriptions and images will lead to more sales and more revenue.The exact same rules apply when selling overseas. Your website should be localized so that it makes shopping simple for international shoppers. At a minimum, your store should display products in the shopper’s local currency and offer the country’s preferred payment methods. Don’t show product prices in U.S. dollars when the customer is primarily familiar with Euros, Yen, or another currency. And even though you may think that everyone likes to use their credit card when purchasing online, customers in other countries often times opt for other payment methods like bank transfer, debit card, or Carte Bleue. Thankfully, small business owners don’t need to become an expert on currency and exchange rates. Many of the most popular shopping carts and payment gateway providers utilize IP geolocation and intelligence data so that the currency and payment options are automatically localized for the shopper. 3. Know What To Sell Globally. If your online store sells a variety of products – both heavy and lightweight – start by selling the lightweight products to international customers. Small, lightweight items cost less to ship and can often be packed in carrier’s free shipping supplies. 4. Know What’s Legal to Ship Overseas. One of the many reasons international shipping is different from domestic shipping is because of country-specific shipping requirements.Items that are regularly sold and shipped in the U.S. may be prohibited for import in select countries. Nail polish, fresh fruits, vegetables, cigarettes, medical devices, cell phones and jewelry are just a few examples of regulated goods that either cannot be shipped at all or require additional documentation when going to some countries. Don’t fear the list of do’s and don’ts. The USPS, UPS, and FedEx have created helpful guides that list what can and can’t be shipped worldwide. 5. Make Customs Forms Easy to Complete. International shipping does require a few additional forms that aren’t required with domestic shipping. When you complete the Customs Forms, list the contents of your shipment completely. There is usually a limited amount of space, so be accurate, but don’t be wordy.Remember that if you’ve been smart capturing information about your goods in advance, these forms are a breeze to complete. Do you know the country of origin for your goods? Do you multi-source goods? Did you capture the HTS (harmonized terrify system) codes? If this sounds confusing, you can dramatically simplify the process by using eCommerce shipping software. Then, all you have to do is hit print and the customs forms are automatically generated for you. recipient addresses, including phone numbers and zip codes. The full country name should be listed on the last line of the address. 7. Be Smart with Packaging. You want your product to arrive intact, and one of the easiest and most affordable ways to do this is by using the appropriate packaging. Shipping supplies are designed to protect the items you’re shipping, but they can only do that when you use the right packaging material for your product.Use new boxes or poly-mailers that are appropriate for what is being shipped, and make sure you leave plenty of room for cushioning. Whether you use bubble wrap, foam rolls, peanuts, air pillows, or a combination of all of them, don’t skimp. Cushioning is inexpensive insurance that will help ensure your product arrives safely. 8. Weigh and measure the Package. Size and weight restrictions apply when sending items internationally, and the restrictions vary by country. Contact your shipping carrier in advance so you know the restrictions for your destination. If you want to skip weighing and measuring entirely, send your items in flat rate boxes that are available from some carriers. 9. Know All of the Costs in Advance. High shipping costs, duties, and taxes are one of the biggest reasons for cart abandonment in cross-border transaction. Thankfully, carriers like FedEx, UPS, and USPS help you calculate the total cost (also referred to as the “landed cost”) before you ship, so there are fewer surprises for you and your customers. Communicate the costs clearly to your customers so they’re not surprised. 10. Reduce Shipping Costs. Just as with domestic shipping, don’t be afraid to think outside of the box to save on shipping. Experiment with pricing strategies like flat rate shipping or free shipping. Another great way to reduce costs is to adjust the package’s delivery time. If the customer doesn’t mind waiting a few extra days to receive their item, they will see a tremendous savings in shipping. 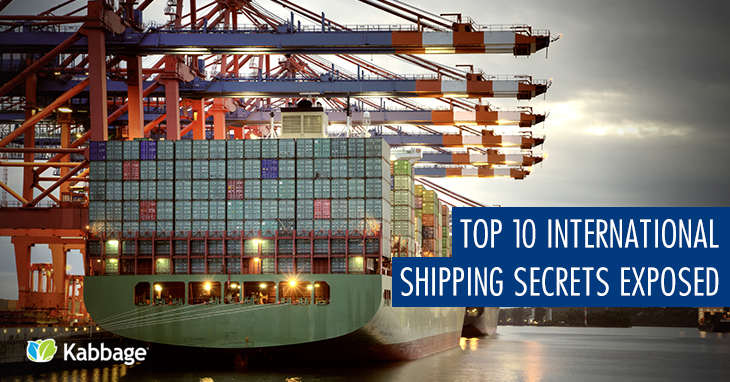 Selling and shipping internationally isn’t hard, but it does require some upfront homework. Once you learn the basics and put it into practice, you will grow your business and expand your global footprint.